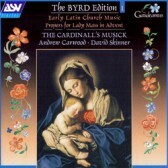 The first in The Cardinall’s Musick’s series devoted to the music of William Byrd and the first of three to look at the music which exists only in manuscript and was never published during his lifetime. Highlights include the massive 9-part motet Domine quis habitabit scored for men’s voices and the emotionally charged Peccavi super numerum which deserves to be ranked as one of Byrd’s finest motets. Also here is the first of the liturgical units from the Gradualia publications which starts at the beginning of the liturgical year with the five-part settings for Lady Mass in Advent and the witty Marian antiphon, Alma redemptoris mater.